Whether you’re a serious athlete, or just trying to get back in shape for the new year, having the right pair of headphones is going to make the difference between a great run and gruelling slog. Unveiled at CES 2019 in Las Vegas, the in-ear headphones are fully cordless, and connect automatically to your smartphone via Bluetooth after you have initially set them up. So you don’t have to waste any time untangling cords or struggling to connect to your phone. With an IPX7 water-resistance rating, the FLASH true wireless in-ears should be perfect for running in the rain (as well as sweaty workout sessions), and five hours of battery life makes them ideal for life on the go. They also come with a hard-wearing charging case, which carries 20 hours' worth of charging power. One attractive feature is the integration with UA’s MapMyRun app, which means you can get real time in-ear coaching, taking your performance to the next level. We expect good sound quality, considering the earphones are engineered by audio tech company JBL, with 5.8mm drivers designed to pump out powerful bass. 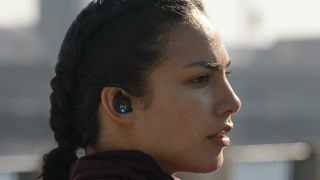 The FLASH true wireless in-ears also feature JBL’s ‘Bionic Hearing’ tech, which allows you to hear your surroundings via two sound technologies: TalkThru, and Ambient Aware. UA says that, “with TalkThru Technology, music is lowered an speech is amplified by a microphone with a touch of a button, making it easy to chat with a workout partner or trainer between sets”. Ambient Aware mode, on the other hand, amplifies background noise from cars, cyclists, or passersby while still playing your music – so you can workout safely without sacrificing your killer playlist. The UA True Wireless FLASH earphones are available to buy in the US for $169, which includes free 12-month MapMyRun Premium membership (valued at $29.99). This works out at around £130 / AU$240, though there's no word yet on whether they will be available to purchase outside the US.